Boating - Camping - Fishing. 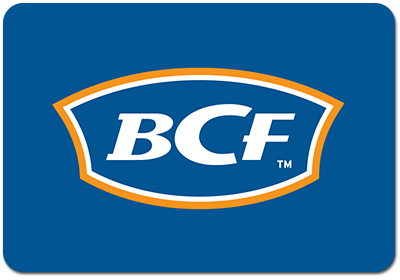 With over 100 stores located across every state of mainland Australia, BCF is one of the largest outdoor retailers in the country. Valid in-store, or online at www.bcf.com.au. Redeemable at participating BCF stores within Australia. Not redeemable for cash or travellers cheques. No change will be given. eGift Cards activated after 11 October 2018 do not expire. eGift Cards activated before 11 October 2018 will be valid for use for 3 years from the date of activation. Any balance that remains on an eGift Card activated prior to 11 October 2018 will not be available for use after the expiry date. Where the cost of the purchase exceeds the available card balance the card holder will be required to make the difference with an alternate form of payment. This card should be treated like cash. BCF disclaims any responsibility for lost or stolen cards.